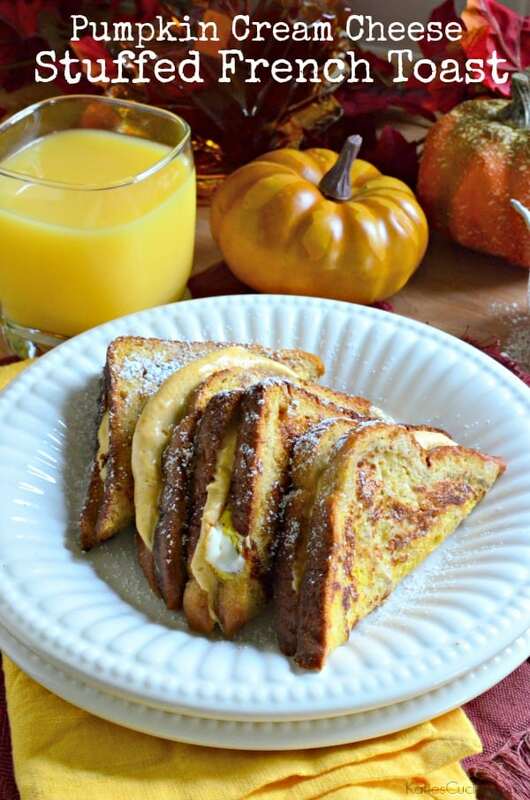 Looking for a festive fall breakfast dish? 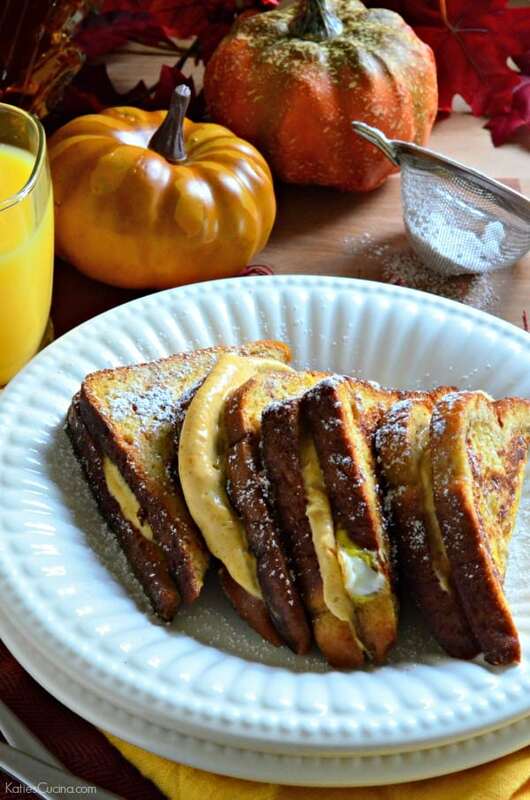 Use up the homemade pumpkin cream cheese and pair it with pumpkin swirl bread to make the most divine Pumpkin Cream Cheese Stuffed French Toast. A few weeks ago, while doing my Monday mid-day grocery shopping I saw that swirl bread was buy-one-get-one-free. We love cinnamon raisin swirl bread so I always buy it when it goes on sale. As I reached for the two bags of cinnamon raisin swirl bread I spotted bags of pumpkin swirl bread. Say what!?!?! I had no idea they even made such a fabulous seasonal bread. So I did what any good wife would do and bought one cinnamon raisin and then one pumpkin swirl. After making homemade whipped pumpkin cream cheese and slathering it on said pumpkin swirl bread, I decided I would make french toast with the bread and then stuff it with the decadent homemade cream cheese. That my friends is how this recipe for Pumpkin Cream Cheese Stuffed French Toast was created. I’ve stuffed french toast before. It’s kind of my thing. I can’t help it I love cream cheese and I enjoy french toast. You can find my other stuffed french toast recipes like Pineapple Stuffed French Toast with Coconut Syrup or my recipe for Cinnamon Raisin Banana Stuffed French Toast and Buttermilk French Toast Stuffed with Golden Plum Cream Cheese. Heat a large skillet on high heat. Spray with buttered cooking spray. Then mix together the eggs, milk, and pumpkin spice. Place a piece of pumpkin swirl bread in the egg mixture. Coat on both sides and place in skillet. Cook on both sides for 1-2 minutes until golden brown. Repeat until all the bread has been cooked. Place one cooked piece of french toast on a plate, then scoop 2 tablespoons of whipped pumpkin cream cheese on the toast. Top with another cooked piece of french toast. Repeat until you have four stuffed french toast pieces. Cut in diagonals, sprinkle with powdered sugar and pour on the maple syrup. Enjoy immediately. This is definitely my kind of fall breakfast! LOVE this French toast! I could eat the pumpkin cream cheese with a spoon! Pinned! Anna the pumpkin cream cheese is to die for! Soooo good! Oh this is SO happening this weekend – YUM!! Ooh Katie! First I must let you know that though I do not comment often, I read all of your posts (they’re all sent to my Kindle with Fabreadly). 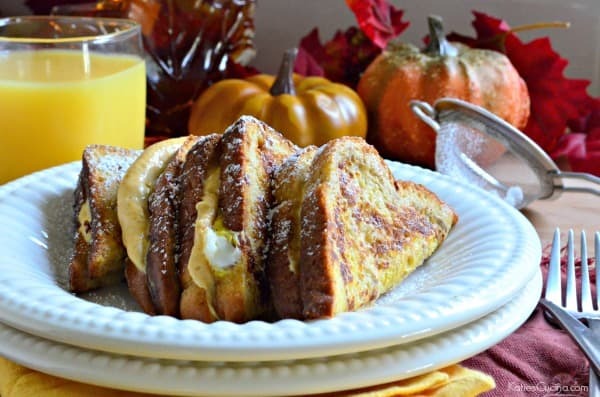 This French toast looks so yummy and I think the homemade pumpkin cream cheese is something I will use on other things too! Was the BOGO at Publix? Im hoping there’s still a sale! !